This is the treehouse lodge that sits atop its own hollowed-out tree. 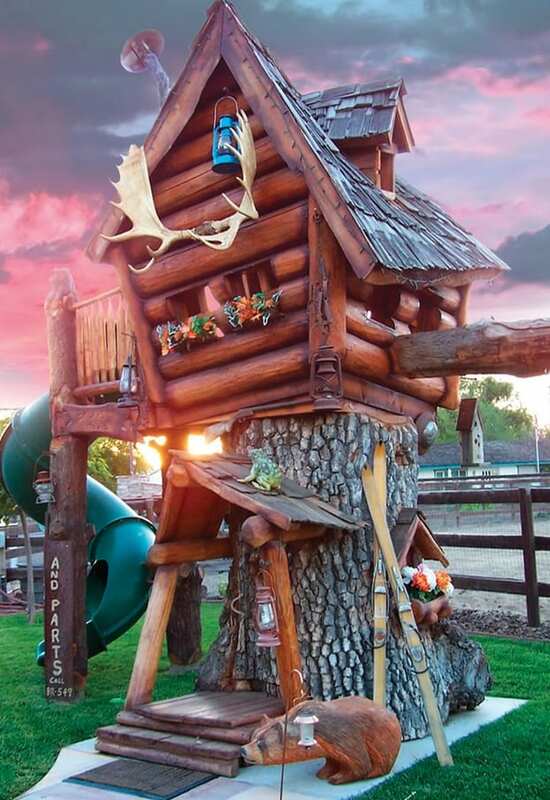 With a real Douglas fir log exterior and cedar shingle roof, it is adorned with rustic elements that inspire creative play and exploration, including a trio of replica oil lanterns and a crooked smokestack. Supported by two 12″-thick redwood poles, the lodge rests on a real hollowed-out 5′-diameter oak or eucalyptus trunk festooned with a covered porch that protects the lodge’s front door. A ladder inside the trunk ascends to a trap door in the lodge’s floor. The lodge’s main room and deck serve as play areas; interior and six windows are framed in Douglas fir. A corkscrew tunnel slide extends from the deck while a swing hangs from one of the support beams.